Collins Booksellers - CLEP 33 by Sharon A Wynne, 9781607875871. Buy this book online. 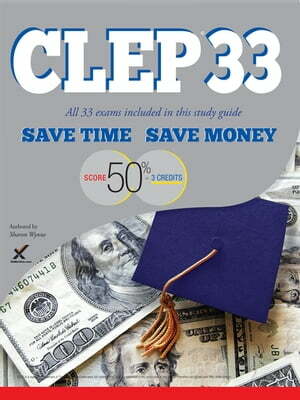 CLEP 33 is a single resource designed so you can see how you would score on every test. You need a full length to accomplish that and only XAMonline does that. CLEP Five brings you one step closer with detailed answers to learn and increase your score. Mastery is most likely with full guides available for the following exams: Principles of Management, College Composition Modular, College Mathematics, Introductory Psychology, and Analyzing and Interpreting Literature. The value of the CLEP 33 can be a tool to get a baseline feel for how many exams you could score 50% on. Therefore, you could make a more educated evaluation on just how successful you would be if you choose these exams. You should take the exams you will most likely pass regardless of your love of that subject. Some exams have as few as 60 questions, for example. Answer 30 correctly and you have just CLEP out of that test. Perhaps you will be motivated to learn the state of Florida accepts up to 75% of college credits from CLEP towards a 2 year degree which is transferable to a 4 year degree. Seize the day! Each of the 33 sample tests are available with full explanations as an individual ebook found on retail websites such as Amazon.com and Barnesandnoble.com To augment the CLEP 33, try our full length content guides.